Last year I had full intentions on making this dress for Halley and Lucy. Now there is one more girl in need of a dress and a pesky thing called moving. Good thing that I have my sweet mother. Who I have turned into my own personal sweat shop worker. day when I feared another Fall would go by without new dresses. I love the fabrics so much more than the combos I originally planned. So here are the assignments. I think they will be crazy cute. My mom is a sewing rockstar. But if you don't have a rockstar mom to save your overwhelmed self, don't fret. I found a shop on Etsy last night with the craziest prices I have ever seen. 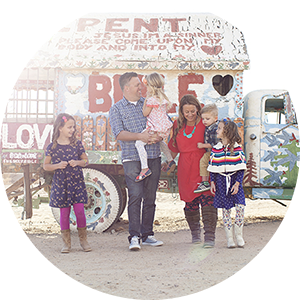 Marissa from CreativeBee has amazing fabric and super fun designs. Plus she is really, really sweet. Go take a peek. You won't be disappointed! OH MY... 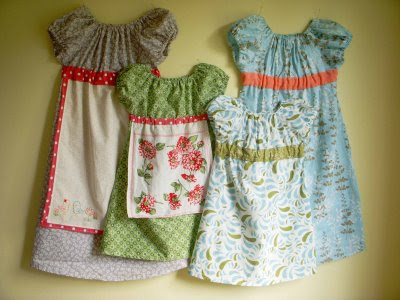 I clicked that link to the etsy shop and suddenly I want to dress my boys in those sweet dresses or adopt a little girl because MUST HAVE. Gorgeous. Can I just say that I went to her etsy site and totally walked away with one of those ADORABLE dresses..YAY! OMG! Clicked on her link...her etsy shop is fantastic! The prices are even more fantastic!!! I am so bummed I live in a cold winter state...I just might have to order some now for next summer in a bigger size :-) Thanks for the tip!!! Wow, you were not kidding. Those prices are amazing. Love them. I hope she sells lots!And your fabrics look pretty amazing too. That brown poka dot one is one of my favorites right now. I made a few pumpkins out of it the other night. loving it! you weren't joking...i just bought a skirt for my daughter and giggled the entire time. so affordable! and cute too. That etsy shop was awesome! Might have to start shopping there since I never manage to make stuff for my own family! I relate to your mom too! I felt like a sweatshop too when i was trying to make like 5 outfits b4 my friend moved to Germany! Those combos look awesome! It will be nice to get some new dresses after/during the move! Hi! Just stopping by from Eli's Lids blog. What adorable patterns and dresses! LOVE THEM! My almost-three year old daughter is in love with dresses and pinks and purples and flowers. I am expecting my third child, a girl, in December and I love your bows!!! If I can remember and have a sec, I'll have to order one or two (and maybe win one on Eli's Lids giveaway). Cool blog! Your mom is awesome! 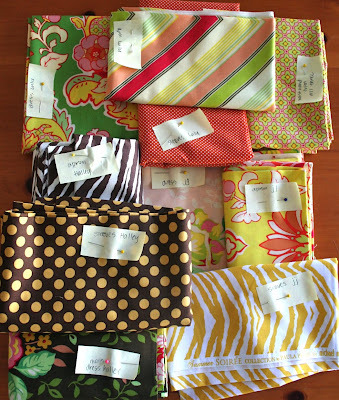 Loooove those fabrics!